In the city of Milan, architecture firm LAD identified a busy roundabout with the potential to host a new public square typology. Sovraparco, literally “over park,” is a design by the Italian firm and Hypnos Studio to better utilize an existing area in the city, Piazzale Loreto, by infusing it with greenery and public space. The project intentionally does not impose on the surrounding buildings to revamp the area, but instead inserts itself into the central space and aims to rethink what belongs to the public sector. Present day Piazzale Loreto is an important central hub and gateway to Milan, yet is surrounded by uninspiring facades and contains no usable public green space. LAD felt it their duty, once they recognized the opportunity, to take on the problem with an architectural solution. Though it is a project with no client or request for proposals, the firm uses Sovraparco to make a statement about the responsibility of designers to use their skills to improve the built environment when and where it is needed. 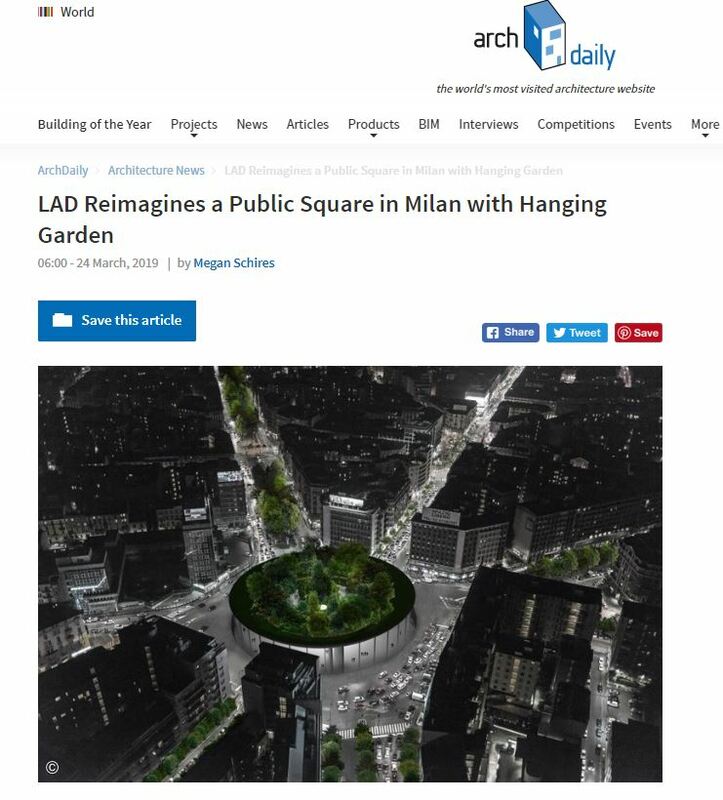 The proposal is a hanging garden above a public square (or circle, more accurately). The imposition of the circle restores the site’s original form as it was in 1865 when it had once already been a public plaza. By inhabiting what is currently a shapeless void, it restores focus to the public, pedestrian function of an area today dominated by vehicles. Below is a heavily trafficked underground junction which would be opened to an airy sunken plaza with the Sovraparco concept. Above, in the garden, the reversed dome shape shields views of the traffic beyond while remaining open to the sky. Visitors are relatively shielded from the pollution and vehicle noise, semi-isolated in the middle of an urban area. The garden has two levels, connected by a system of ramps, with an oculus in the center that looks down into the plaza. LAD determined that with today’s dense urban fabric, introducing green space to the city would be most quickly and efficiently achieved via an addition to an existing space rather than wholesale substitution.